During the last Tube strike passengers were let off a train at the closed and unattended Canada Water station for a second time, BBC London has learned. A leaked report shows the latest incident happened on 29 November, when seven passengers had to make their way to the street through fire escapes. On 4 October, during a previous strike, passengers were trapped at Canada Water for 45 minutes. Transport for London (TfL) said its staff assisted passengers out. The report puts the incident down to "driver error". It added: "This is not the first time this has happened at Canada Water." During the previous incident about 20 people got off a train when the driver accidentally opened the doors. Commuter Juliet Schenker, who had been trapped, accused Tube bosses of running "an unsafe service during the strike". 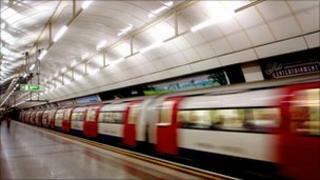 TfL spokesperson said: "Seven passengers were let off a Jubilee line train at Canada Water station. "However due to industrial action the station was closed because of insufficient numbers of staff. "The member of staff on duty spotted the passengers getting off the train and was able to assist them getting out of the station promptly." TfL has been in a long-running dispute with the RMT and TSSA unions over proposed job cuts.